I’ve been in a bit of a cooking rut. It doesn’t happen often, but when it does, I really notice it. Cooking is so much fun and is such a great creative outlet, that when I hit a dry spell, it’s rather uncomfortable. Luckily, it feels as though the fog is lifting, and I’m re-invigorating my creative juices and to the relief of those I feed, I’m busting out some new material. But enough about that. 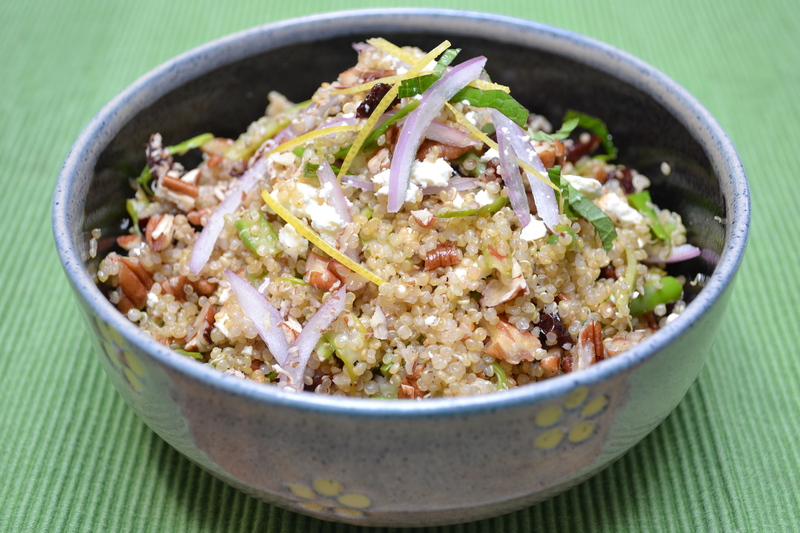 We’ve touched on quinoa here a few times, so let’s talk pilaf. We’ve all been to a wedding or other catered buffet type event and come across a warming tray filled with savoury-looking rice with peas (and possibly tiny cubes of carrot or niblet corn) in it labelled “rice pilaf”. Most commonly made with rice, and most recognizably a Middle Eastern dish (and that label alone encompasses a huge variety of cuisines), pilafs, by many names and variations, are part of a great number of cultures’ menus. At the very simplest, pilaf, is a grain dish, cooked in a flavoured liquid like stock or broth, with added ingredients like nuts, fruit, meat, herbs or vegetables. The beauty of dishes like this, is that the combinations are endless and the rules for what to use essentially don’t exist. Don’t have dried cherries, but you do have dried cranberries? Use them! Out of red onion, but your garden is over run with scallions? Go for it. No quinoa in the cupboard? Do it with rice instead. Mix and match, play around and devise your own combinations of flavours. Myself, I like to keep the fruit tart and not too sweet and I am a nut for fresh herbs, so I like a lot of basil and mint in this dish. But you may not like fresh mint, you might prefer parsley. And that’s okay. So much of the enjoyment of cooking, and one’s development as a home cook comes from experimentation. With a dish like rice or quinoa pilaf you honestly, can’t go wrong, I promise. Even your “worst” will still be edible. So get to chopping and tasting and stirring and play creatively with this dish. Let me know how it goes in the comment section, I’d love to hear what you come up with, or what you think you might try. Enjoy! *if you don’t wish to use wine, by all means, substitute it with more stock or water. Bring the stock and wine to a boil in a small saucepan. Once boiling, add the quinoa and stir. Reduce the heat to minimum and cook, undisturbed, for 15 minutes. Remove from heat, stir and move the quinoa to a large bowl. Stir well to help cool the quinoa, then set aside. Prepare other ingredients and add to the cooled quinoa. Stir well to incorporate everything together. Cover and refrigerate for 1 hour before serving.